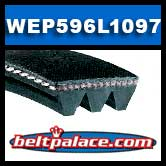 OEM Replacement WEP596L1097 Belt for Massage Chair. Neoprene (black rubber) construction reinforced with high strength polyester cord. Replaces any Massage Chair motor belt marked “179J" with 3 ribs.